The motion which was put down in the name of SNP Westminster MPs yesterday “that this House believes that Trident should not be renewed” had nothing whatever to do with advancing the cause of disarmament or preventing the renewal of Trident. That is an objective the SNP does not share. If they did, they would seek to cooperate with Jeremy Corbyn’s Labour Party. Instead they sought to divide it and so to weaken the combined opposition to Trident renewal in the hope of political advantage north of the border. A narrow sectarian objective. It is true that the bulk of Labour MPs abstained as they had been asked to do in order to allow a proper review of Labour’s policy, one which can properly take into account the government’s announcement on Monday that the total cost of renewing Trident has risen by £6bn to £31bn and the start date for the replacement submarines – which carry the missiles and warheads – had been put back until “the early 2030s”. 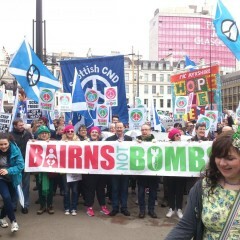 However, 14 Labour MPs voted with the government in favour of Trident (Kevin Barron, Ben Bradshaw, Mary Creagh, Chris Evans, Jim Fitzpatrick, Liz Kendall, Chris Leslie, Madeline Moon, Albert Owen, Jamie Reed, Emma Reynolds, Angela Smith, Gisela Stuart and John Woodcock) whilst six voted with the SNP against Trident (Roger Godsiff, Ronnie Campbell, Kelvin Hopkins, Graham Stringer, Dennis Skinner and Geoffrey Robinson). The manifesto outlined Labour’s commitment to a minimum, credible, independent nuclear capability, delivered through a Continuous At-Sea Deterrent. the process and debate leading up to the next Strategic Defence and Security Review in 2015 needs to be open, inclusive and transparent, examining all capabilities, including nuclear. The SNP have no interest in ridding Britain of nuclear weapons Their only interest is the more parochial ambition of removing Trident from Scottish soil following independence. Posted in: British Regions/Nations, Labour, Politics, SNP, War/Defence. This is a ridiculous piece. There is only one thing to do when Trident renewal comes up for discussion and that is vote against. If Labour stuck to some socialist principles it might not fall into so many traps sectarian or otherwise. In fact this seems like a proper diversion from the real issue Labour should be tackling the SNP on at the moment and that is their statement that they will give `serious consideration’ to Cameron’s proposals to kill Syrian children. The SNP’s position is not “sectarian”, it’s nationalist; and Jon’s perspective here is not “anti-sectarian” but unionist. Moreover, if one wants an independent Scotland, complaints about a Scots unilateralist position on Trident are going to sound pretty hypocritical coming from someone who argues for unilateralism on a UK unionist basis. I think that Jon Lansman is right. Why would the SNP have forced this debate before Corbyn has had sufficient time to prove that the majority of Labour members are opposed to Trident (thereby giving him leverage over centrist Labour MPs who might prefer to sit on the fence)? Jon is right to call this sectarian politics. It is aimed at embarrassing Scottish/National Labour to the SNP’s advantage. Moreover, this view is widely held this view is widely held by commentators. I did, and still do, have some doubts about the wisdom of another vote. However, it is done now and we can see that 14 Labour MPs have such a fondness for nuclear weapons that they are prepared to defy the whips’ instructions to abstain. Some of them claim to support Trident because of the jobs it brings whilst claiming that they support a global ban. But a global ban would still result in job losses in just the same way as a unilateral divesting of nuclear weapons would. People must, therefore, decide if they think these people are really telling the truth. I do not think that they are. Incidentally, we should not forget that two thirds of Margaret Thatcher’s cabinet opposed the original decision to purchase Trident back in 1980.